Jaisalmer, the “Golden City,” is located on the westernmost frontier of India in the state of Rajasthan, located 575 kilometres (357 mi) west of the state capital Jaipur. Once known as Jaisalmer state it is a World Heritage Site. 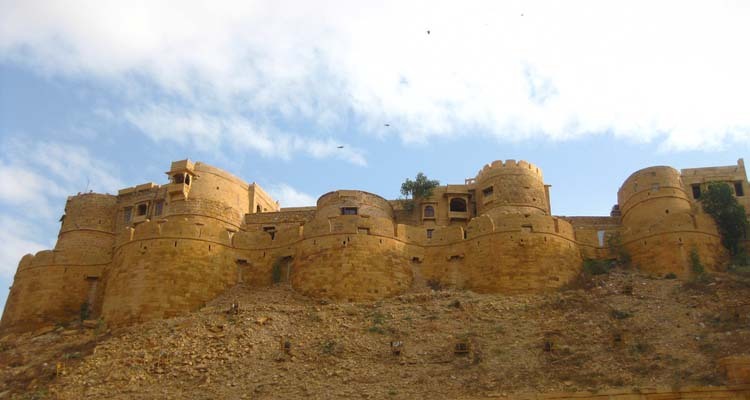 The town stands on a ridge of yellowish sandstone, and is crowned by the ancient Jaisalmer Fort. This fort contains a royal palace and several ornate Jain temples. Many of the houses and temples of both the fort, and of the town below, are built of finely sculptured sandstone. The town lies in the heart of the Thar Desert (the Great Indian Desert) and has a total population, including the residents of the fort, of about 78,000. It is the administrative headquarters of Jaisalmer District. One of the most magnificent attractions is the Jaisalmer Fort, also known as “Sonar Qila,” due to the yellow stone with which it was built. Ghadsisar (Lake): is a rainwater lake which supplies water to the city. Sar means a lake. King Ghadsi of Jaisalmer got it made 650 years ago with the help of the people. It is surrounded by temples and tombs of saints. Boat rides are offered. Nearby is the desert cultural centre and a local museum built out of the collections of a local schoolteacher, Mr. N.K. Sharma. This centre conducts puppet shows in the morning and evening. There are people who will try and sell you bread to feed the huge number of catfish in the lake. Jaisalmer Fort: Colourful shades of the setting sun and golden hues of the desert ambience give a fairy tale look to this mega structured fort. The interior of the fort is amazing. It is a ‘working fort,’ meaning that unlike every other fort in India, there are people living and working within its walls. Tourists can also visit many havelis of rich merchants, which are also having a touch of great classical interior and design. There are numerous lookouts (at least five) within the fort that give a great view out across the city and desert. A tour of the royal section of the fort is available from a starting point just to the right up the stairs as you enter the main square of the fort). The audio tour takes about one hour and 15 to 30 minutes. At the final few sections, there are two advertisements in it – not a must, the view is what you come for. Jain Temple: There are seven beautifully carved temples built inside the fort walls. These temples were built between the 12th century to 15th century. All the temples are connected by walkways and corridors. It is compulsory to remove your shoes and all other leather articles (belts, wallets, purses, etc.) before entering any Jain temple. The very first temple which a tourist can visit is dedicated to Chandraprabhu, who is the eighth tirthankar (Jain God). The symbol of the God Chandraprabhu is the moon. This temple was built in 1509. It is built with fine stones. They are only open from 8am to midday. Leave a good hour to see them. Havelis: Patwon-ki-Haveli is a ten-minute walk from the main gates of the fort and quite magnificent. It’s a collection of five houses, each one for the son of a wealthy trader who made money lending to the government. One of the havelis (closest to the street) has been restored and turned into a government museum. Expect to spend two hours there. Great view back towards the fort. Renovated streets and houses: The city is currently undergoing quite extensive renovations, and particularly the small streets on the way to the Patwon-ki-Haveli have been redone with many houses now showing off exquisitely carved front sandstone walls. The houses are much more intricate and interesting from street level than they appear from the fort. Jaisalmer is not directly connected by air with any part of India. Jodhpur Airport, located some 300 km away from Jaisalmer, is the nearest airport to the desert land. The airport connects Rajasthan with all major Indian cities. From Jodhpur Airport, tourists can hire cabs to reach Jaisalmer. Jaisalmer serves rest of India by well maintained network of roadways. Deluxe and ordinary buses of Rajasthan Roadways as well as many private operates connects Jaisalmer with Jodhpur, Jaipur, Bikaner, Barmer, Mount Abu, Ahemdabad etc. From the bus terminus, passengers can avail local means of transport to reach their respective hotels or attractions. Jaisalmer is served by both broad gauge and metre gauge railway tracks. Direct trains from Delhi, Jaipur and Jodhpur can be availed to reach Jaisalmer. The luxury train ‘Palace on Wheels’ can also be availed to reach Jaisalmer. On reaching the station, visitors can avail auto rickshaws and private taxis to reach to their respective destinations at nominal fares.